God is doing some incredible things here in Africa. Things that you see happen and know they are undeniably done by God. 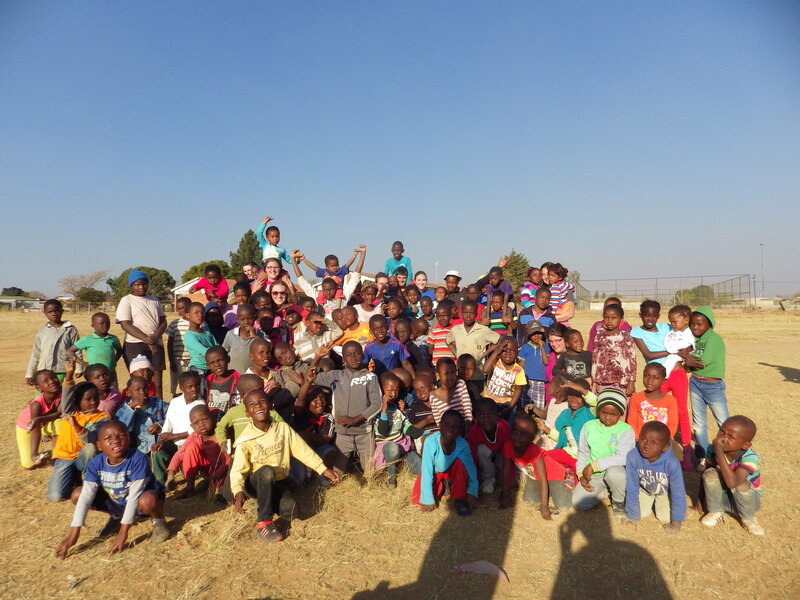 I just returned from taking my group on a short village trip to a town called Kwaggafontein. It’s a couple hours north of Joburg,and it’s a completely different world up there. We were the only foreigners there so our activities attracted a lot of attention. One valuable lesson I learned came when I went to the local grocery store. That lesson is don’t go into the local grocery store alone. If one goes into said local grocery store alone, one might get slightly molested by local grocery store worker. Enough about that. I wanted to share something that was truly incredible. A few days ago the teams were all out talking to people house to house and getting to know the community. I was walking to try and meet up with them when this man who had a little shop set up on the road called me over. He said he wanted us to come and help him. I sat down and we talked for a quite a while. His name is Lucas. Lucas has two kids and one on the way, and he’s struggling to make ends meet. We here this story over and over here in Africa just of suffering and struggling to survive. There is a lot of poverty here but also unparalleled joy; it’s absolutely incredible. Though there is suffering, everywhere we go, we’re met with the biggest smiles you’ve ever seen. Lucas shared with me that he’s to the point where he’s crying each day and wonders if God is there. But he does believe in God. We went through a few things he’d been taught that weren’t exactly right, like having to give the money that he makes to the church so that God would bless him. I was able to share with him that we can’t buy God’s blessing. In fact, we’re all created equal, we’re all sinners and we need something much bigger to save us and to provide for us. That something is the God-person, Jesus Christ. I encouraged Lucas that God would provide for him. He said specifically he needed eggs and avocados because that is what people bought most, but he didn’t have money to buy those things. So after our talk, we prayed for God’s provision, and I said goodbye. It was such an incredible moment. God exists! He is REAL and He provides. Psalm 145 says that He opens His hand and satisfies every living creature at the proper time. Hold on for God! He will provide for you. Even the next day I visited Lucas again, and he had gotten another job offer for the weekend for a good amount of money. He knows things won’t always be easy, but it’s important to wait on God because God cares for us like no one else possibly could. It’s been so great spending time with the African people and seeing God work. Sometimes I still find myself thinking and say, “I could have a great job and plenty of money right now.” But when people like Lucas come along and God reveals Himself so clearly, it’s hard to imagine ever doing anything else. It’s hard to see what else could be important in light of all the hurting and wounded people in the world. People are on God’s heart! If you’re reading this, you’re on God’s mind. If you’re reading this, God can use to reach out and bring hope to someone. Reach out today. Please share this post on Facebook with anyone who needs a boost in faith today! 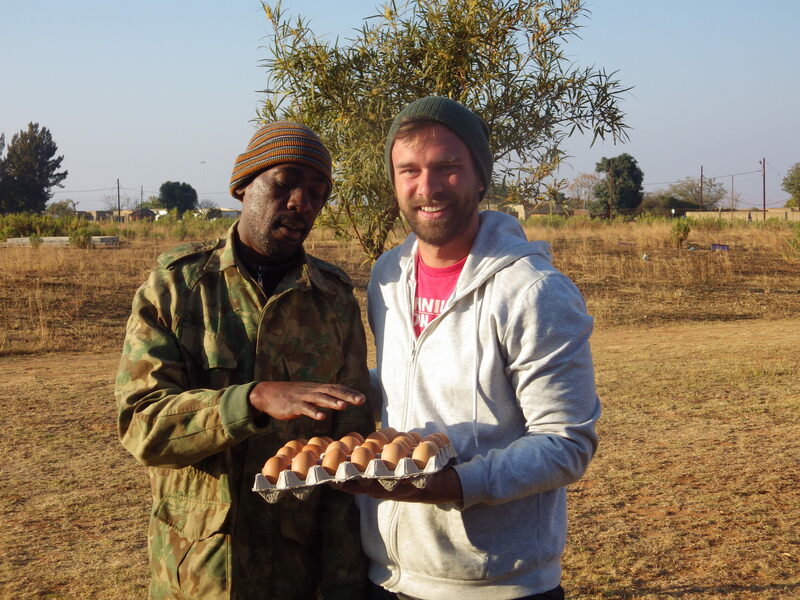 Lucas and I with his eggs to sell. We did a few kids programs for neighborhood children. There were about 125 kids for this round.